Happy basket full of chocolate day! When I was a wee muffin, Easter meant that a human sized fictional bunny would sneak into my bedroom when I was sleeping, and leave me a basket full of chocolates, candies, and sometimes little toys or gifts. The whole thing had a very Santa Claus vibe to it, and so of course, I absolutely loved it! If I’m ever at my parents house for Easter I still sometimes find a treat left outside my bedroom door. Aww shucks, thanks Mom…er, I mean Mr. Easter Bunny. Easter egg hunting was a whole other part of the holiday, and it was full on war. Every year the fam (there is somewhere around 10 cousins) would go to a family members house to celebrate Easter. Upon arrival I would secretly scout out and memorize where all the Easter eggs were hiding, while acting like I didn’t care, and definitely wasn’t cheating. All the kids would be sitting on our hands desperately trying to act natural, until FINALLY some aunt would decide it was time to start the Easter egg hunt and then we would all frantically dash around collecting as many chocolates as we possible get our mitts on. There was no equally dividing the chocolates among us, or any of that very fair sharing thing kids do nowadays. What you were able to collect was what you got. At 6 years old chocolate was VERY serious stuff, so yes, this was incredibly stressful for me. Now I am so much more civil, I will just make large batches of chocolates at home, and not share them with anybody, so there. Ok, ok, I will share… if I have to… I guess. One of my most favourites chocolates was Reese’s Peanut Butter Cups, which I am pretty sure is one of the worlds most favourite chocolates. I think there are some rather pricey vegan versions of these that you can buy, but seriously dude, these are so easy to make. Like kinda too easy to make. So easy to whip up and then have 20 chocolates sitting around staring at you, Gah! I’ve seen some vegan recipes where they just fill the center with peanut butter, and you have to keep them frozen or they will melt… My recipes is not like that. 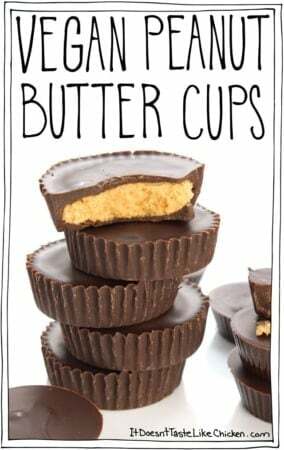 You can make these and once set, they are totally shelf stable, and sugary delicious, just like Reese’s, except so much better. To make Vegan Peanut Butter Cups, just mix up the peanut butter with powdered sugar, vanilla extract, and salt. It forms this kind of peanut butter dough. Taste it. You’re welcome. 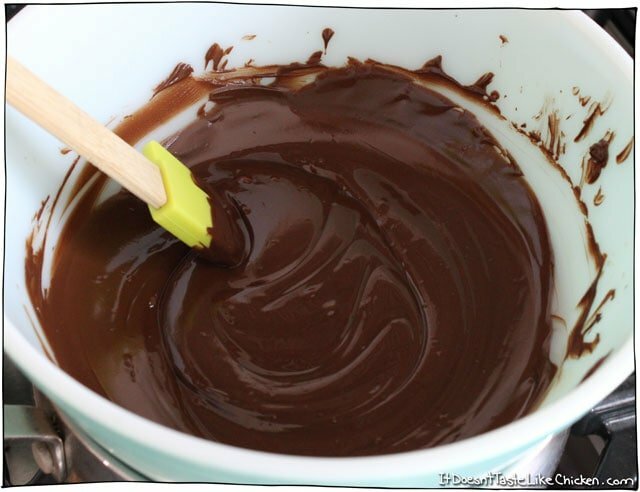 Melt your chocolate chips in a double boiler, then remove from heat. If your chocolate firms up while you are working with it, just pop it back on the double boiler to melt again. If you don’t have a double boiler, you can use my method, and just pop a heat safe bowl over a pot of boiling water. Congratulations, you just made yourself a double boiler. The reason you want to melt the chips in a double boiler vs. a pot directly on the heat, is that chocolate burns and turns grainy very easily, and once it burns there is no going back. Your chocolate is ruined. So melting it in a double boiler ensures it doesn’t burn. You could also melt your chips in a microwave, but I don’t have one of those, so you are on your own with that one. 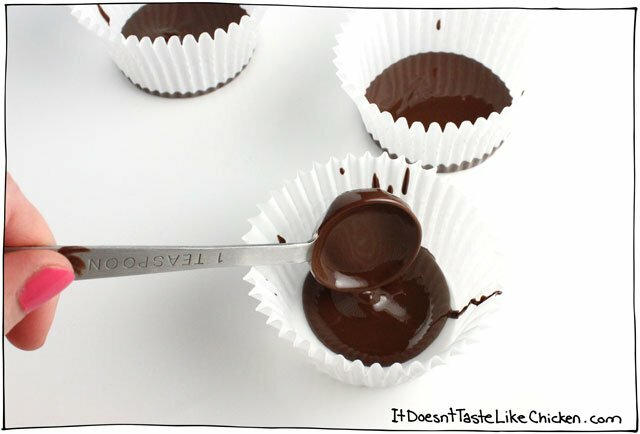 Take some cupcake liners and pour in about 1 to 2 teaspoons of chocolate. Just enough to cover the bottom of the liner. 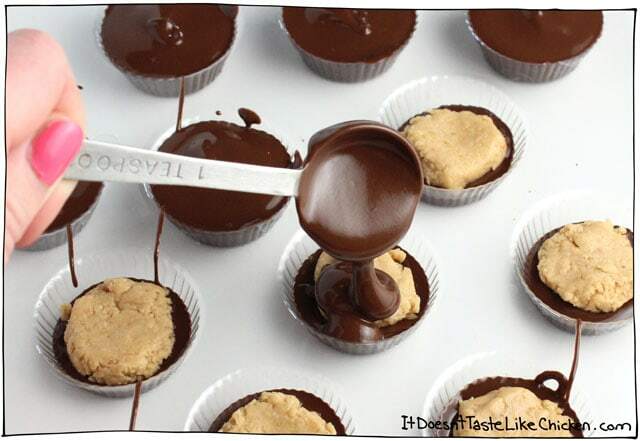 You can use the spoon to spread the chocolate around. Now pinch off some of your peanut butter dough, and shape into a disc that is just a bit smaller than your liner, so that there is room for the chocolate to go around the edges of the dough. This does not have to be beautiful. I like a thick peanut butter center, but you can decide how much or little peanut butter dough to use. Now use another spoonful or two of chocolate to cover the peanut butter disc. You may need to use your spoon to help spread the chocolate. Repeat with all of the remaining chocolate and peanut butter dough. Put the chocolates on a baking tray so they are easier to manage, and then pop them in the fridge for about 30 minutes, until the chocolate has completely firmed up and set. Once set you can peel off the cupcake liners, or just trim down the wrappers if you want to leave them on. Store in an airtight container in the cupboard. You can also use any chocolate mold or silicon mold to make fun shapes. 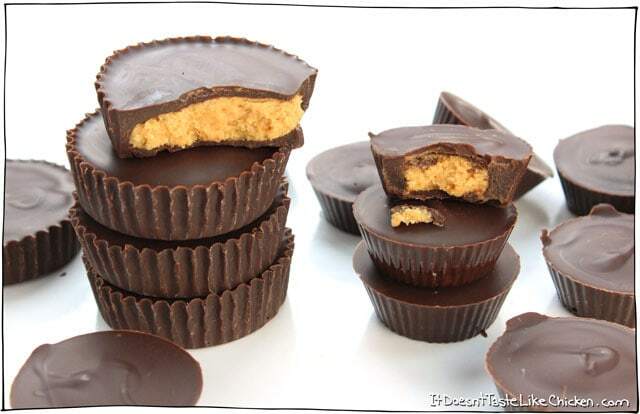 I had these mini peanut butter cup molds that I followed the same process with. There are a ton of fun shapes on Amazon such as these Easter Egg Molds, Christmas Tree Molds, Truffle Molds, and if you ever wanted Moustache Shaped vegan peanut butter cups, you can definitely make those. 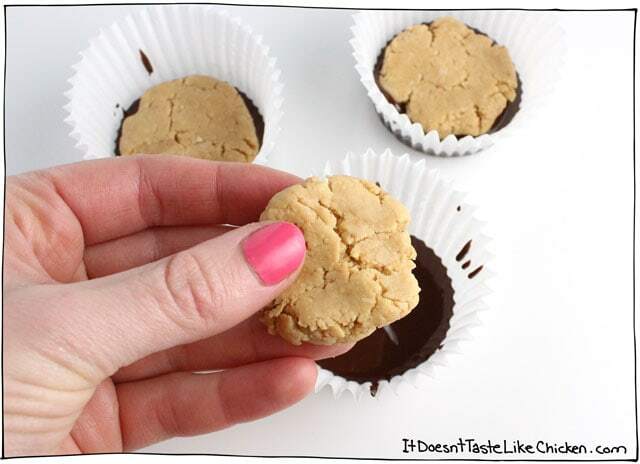 Or if you are feeling crafty, you can also shape the peanut butter dough into balls or egg shapes and then just dip the dough into the chocolate and lay on parchment paper to set. 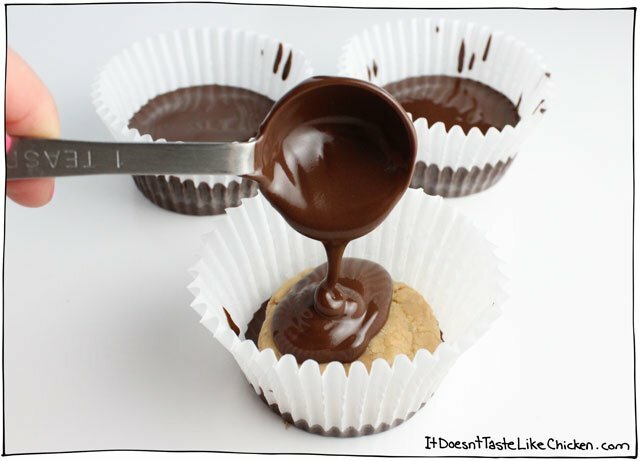 So easy to make and they taste just like Reese's! A great recipe for Easter, Christmas, or just when you are craving chocolate. Put in the fridge to cool and set for about 30 minutes. Once the chocolate has solidified again, you can pop them out of the molds, or just trim the paper liners if you want to leave them protected. Store in an air-tight container in your cupboard. Previous Post: « 1 Year Full-Time Blogging & New Video! Can I use honey, maple syrup? Hi Zehra, you would need a powdered sugar alternative for this recipe to get the correct texture. Powdered sugar is just cornstarch and sugar so maybe if you use cornstarch along with the sweetener of your choice it may work. Perhaps stevia would work best since it’s in powdered form and won’t alter the texture. I made these with almond butter for a charity event last weekend and they were a huge hit. So easy and so delicious! Thanks! O…..M….G!!!!!!!! This is absolutely delicious!! Better than Reese’s. (And I LOVE Reese’s). I had to melt more chocolate to be able to make 12 cups and I had to add powdered sugar to the PB mixture so it holds better. Otherwise, I followed your recipe. These came out amazing. I’m bringing them in to work tomorrow – well, minus a couple extra I’m keeping home for myself 🙂 A tip for anyone whose peanut butter dough is too sticky: I rubbed some powdered sugar in my hands before picking up and shaping and everything came together just fine. Thanks for another great recipe, Sam! Thank you for sharing your recipes. 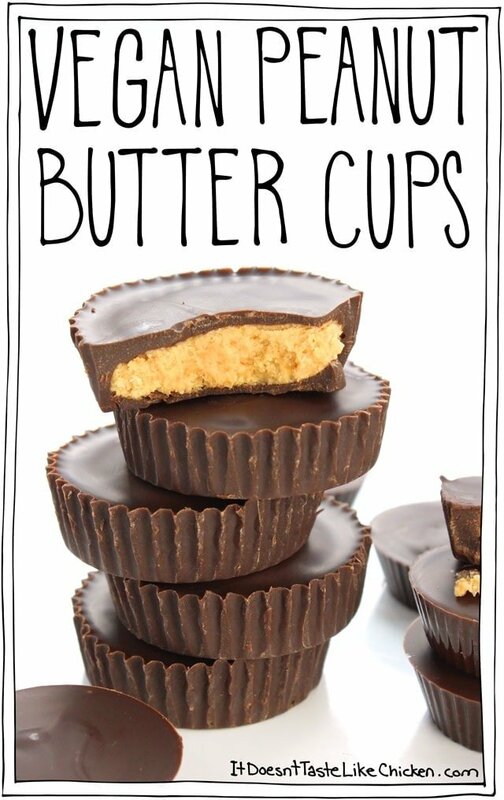 I am planning to make your vegan peanut butter cups first. My question is this: I have some carob chips in my cupboard. They look just like chocolate chips. They have been there awhile, and I would like to use them up. Can carob chips be mixed in with chocolate chips, and be melted together? Thank you. Personally, I’m not a fan of the taste of carob so I haven’t done much cooking with it. I do know that it does not melt the same way as chocolate so I would say that it wouldn’t likely work well. Best of luck! Thank you for the response Sam. I will stick with chocolate chips for now. Maybe someone at our vegan potluck, where I will be sharing the vegan Reese’s that I am going to make using your recipe, will have an idea for what to do with carob chips. Just made these yesterday, and let me just say, they are EVEM BETTER than Reece’s cups! (I know! I didn’t think that was possible!) Next time, I’m going to make even more of the peanut butter dough to make them extra peanutbuttery (is that a word? It is now.) Another amazing recipe. Thank you so much Sam!! i love them! But, my PB blobs were not as solid as yours (overmixed maybe?) so the top chocolate wants to swirl into it. Maybe next time I will refrigerate between layers? And what a mess, how do you get yours so perfect? haha mine were rather rudimentary looking. Oh well, it’s the good taste that counts! yum! Hi Tara, the peanut butter blobs can vary a bit depending on how liquidy the peanut butter is. Sometimes I find natural peanut butter quite firm and other times quite oily and thin. If you have this problem again, just try adding a bit more powdered sugar to thicken. Enjoy! I just made it and it’s fab. I wish I could upload the picture to show you.thanks again Sam. You’re most welcome! I hope you love it! Hi! Just wanted to let people know that not all peanut butters are vegan! I found this out the hard way when I went to make a last minute sandwich for my brother who is vegan. Some have honey, thus not being vegan. Just wanted to help prevent any mix ups so everyone who wants to be vegan doesn’t have an issue! 0.1mg Cholesterol? WTF are you talking about?? I use a nutrition program, obviously, it made an error. I am currently working on updating to a new program. Hi Kat! Cups are volume measurements, not a weight measurement so I don’t know how much the chocolate chips weigh. I know a couple of my UK readers have picked up a set of measuring cups and spoons online so that they could easily make any Canadian or US recipe without the need to convert. Other than that you can just try your luck at google. This site says that 1 cup is equal to 175g. Hope that helps! My favorite are the PB eggs! I’ve been eating them since their first appearance over 30 years ago! SO NOW i will make these for Easter (and now, of course) Will post after i taste them! My husband and I finally gave up the dairy! We were vegetarian, but after buying some delicious artisanal cheese, I looked at the ingredients and saw “rennet”. Well then I had to look up “rennet”, and was shocked to find it comes from the stomach of baby calves! So that was it, no more dairy or eggs! Unfortunately this happened right before Thanksgiving, so the usual highly dairy-laden-fare was out, along with all the lovely Christmas candies, nogs, etc… I bought a few Justin”s peanut butter cups which were delicious, but way over-priced! Then I found this recipe and I am not feeling so sorry for myself anymore! Thank-you so much for these easy, inexpensive treats! I’m going to try the nacho cheese tonight! I’m sold! Just made these tonight as I was craving chocolate. They really are delicious, and so easy to make! I often buy Justin’s dark chocolate peanut butter cups, but not anymore! These peanut butter cups taste way better! I used Trader Joe’s chocolate chips and Skippy natural creamy peanut butter. I wonder how crunchy peanut butter would be…THANK YOU for sharing this wonderful recipe! Well tonight things did not go well. The chocolate chips would not melt enough be poured. I tried a second double boiler, with more of a clean metal surface for the most heat transfer, and also used the Turbo setting on my stove. But it never poured like it does in your video. I used an organic brand of chocolate chips, and the house brand from Shop Rite supermarkets. I started with double the amount in your recipe, 2 1/2 cups, but when it would not melt well, I took half out, but it would still not melt enough to pour. Ultimately, I did manage to get all of the melted chocolate into about the same amount of cups as in your recipe, so that my peanut butter cups are larger and have more chocolate in them. It took 2 hours, and I still have not cleaned up the 2 double boliers. I guess I could try the Trader Joe brand of chips that Cindy says she used successfully. What specific brand of chocolate chips do you use Sam? Thanks. Yikes, it sounds like something was off with the chocolate chips you used! I use Presidents Choice brand which is available here in Canada, but I have always used Enjoy Life. Best of luck! what about adding some unrefined coconut oil to chips when melting? I wouldn’t recommend it as the chocolate may not harden properly. I’ve made these twice and they are really easy and delicious! For some reason though, I can’t seem to get my peanut butter mixture to a dough-like texture to make the “disks”. It’s really sticky and I kind of just plop it onto the chocolate (it’s almost like regular pb). I even tried popping the mixture into the freezer for a few minutes and that didn’t really help. Also, mine seem to get melty as soon as I take them out of the fridge and the chocolate always transfers onto my hands. I live in the south and I’m wondering if it’s just the temperature? Maybe my house is just a bit warm? Either way, thanks so much for this recipe!! 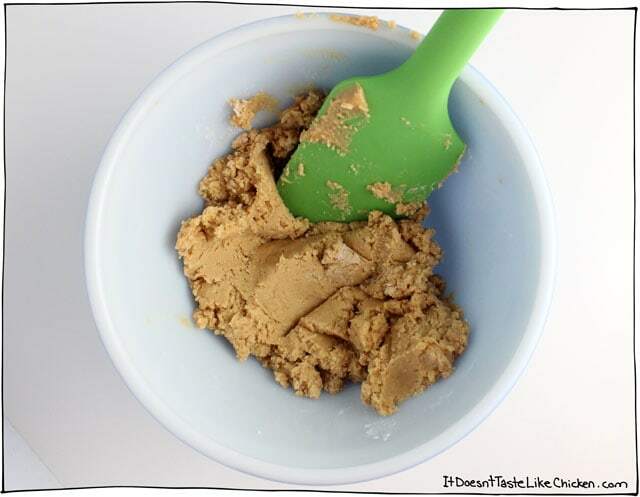 I meant to ask – do you use an electric mixer for the peanut butter or just stir with a spoon or spatula? So happy you love them, Catherine! For the chocolate, I would just say that depends on the kind of chocolate you buy. If the chocolate chips get melty at room temperature, so will your chocolate. For the peanut butter, it’s possible that the natural peanut butter you are using is oilier than the one I use. Try reducing the amount of peanut butter and slowly add more until desired texture is reached. I just mixed it in a bowl with a spatula as seen in the above pictures. It is possible that the heat is making everything a little melty. Hope that helps! Thanks for the reply! I will try it with a different peanut butter and see how that works…just for research purposes, of course. Hahahaha, yeah… They are totally addictive for sure. Just imagine when I was recipe testing these and had batch after batch in my house! Lol I can only imagine. You seem to have a lot of energy as it is, so it must be fun being around you when you’re on a sugar high haha. Note to self- Sam’s vegan pnut butter cups are easy to make! I told myself this last time I made them, then I forgot. Yum! I cannot keep these around when I have them; I give half away and keep the others hidden in the fridge to pull out every now and then. P.S. I have Sam’s Easy DIY Sweet Potato Dog Chews in the oven for my pup. Thanks Sam for all the treat ideas! Hi Sam, just make these for me as an Easter treat since I won’t be getting any chocolate. OMG, amazing…this is so delicious, even my husband who doesn’t like dark chocolate loved it. Thank you so much for this wonderful recipy, we’ll one amoung many others. Hi there! Unfortunately I need to restrict added sugars (which I save for the chocolate, lol). Do you think something like coconut flour will work instead of the powdered sugar which I assume is icing sugar? Thanks! I’m hoping to make these tonight. The sugar not only adds to the texture but of course adds a lot of sweetness. Without experimenting, I really have no idea if coconut flour would work. I know it definitely wouldn’t taste the same, but perhaps you might get a similar texture. You could alternatively use just peanut butter- freeze the peanut butter on top of the chocolate before coating on the second layer of chocolate. I would store them in the freezer to make sure they aren’t runny. Hope that helps! All of the ingredients used are totally shelf stable, so they should be just fine kept in an air-tight container at room temperature for up to a month. I’ve never tried freezing them but I don’t think that would be a problem. Enjoy! You don’t grease the paper cupcake liners? I feel like they will definitely stick and that paper will never come off! But all of yours look so perfect. I’ve never put melted chocolate into a paper liner, I just wanna make sure it will be work before ruining a batch! Enjoy Life chocolate isn’t cheap! Nope, no greasing of the cupcake liners. Cupcake liners are generally a little non-stick to begin with, and won’t stick to the chocolate. Once the chocolate is completely solid they remove very easily. Enjoy! 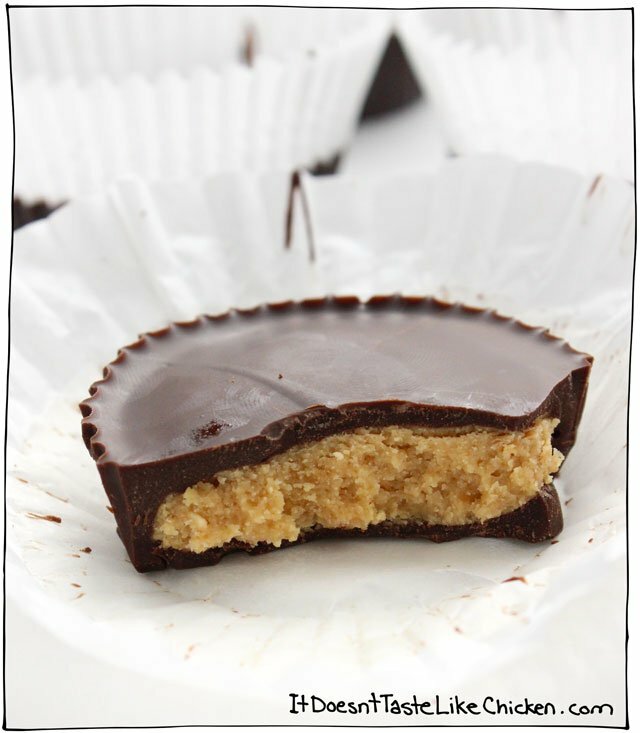 Wow by far the most amazing vegan peanut butter cups ever!! Yay!! So happy you loved them Amy! 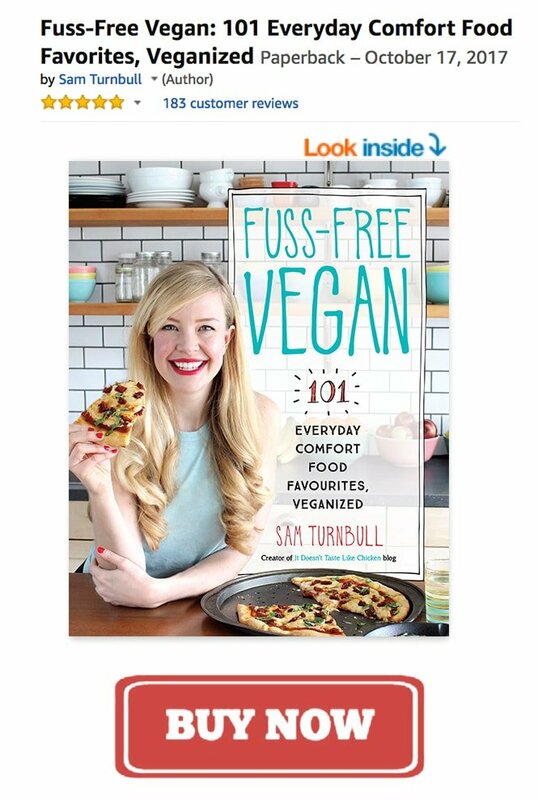 Vegans don’t eat dairy, so all the recipes on my site would be perfect for anyone who is sensitive to dairy products. Just make sure you check to ingredients on the chocolate chips to ensure they are dairy-free. Enjoy! I tried Justin’s peanut butter cups a few weeks ago and they’re so good but soooo expensive! Then I luckily came across your post and tried it out a few days ago and I’m completely sold, no need to ever buy them anymore 😀 😀 Thank you for sharing!!! I’m so excited to try these! Love that they will retain shape at room temp, brilliant! Ooo I hope you like them!! Yes, frozen chocolate is not for me! Amazing! Simply perfect. Thanks for the creative recipe and detailed instructions. This looks amazing! I was wondering, can you sub the vegan choc chips with other vegan chocolate? I have some big bars of dark chocolate going spare, but wondered if there’s something specific to the choc chips that make them a better choice. Hi Amy, other chocolate should work just fine. Chocolate chips melt easily and are readily available so that’s why I opt for those, but if you are using a chocolate bar, just chop it up before melting so it melts evenly. Enjoy! This recipe is amazing – just too easy and too wonderful!! Cupcakes. It’s a slippery slope. Once you get into them, your whole world becomes a fight dominated by them. Arguments for them; arguments against them. Wise sayings and crazy folklore about the harm and benefits. Your money goes on peanut butter and chocolate chips and vanilla essence. Your work colleagues shun you. You can’t sleep without imagining the scent of dark chocolate. Eventually, you have to go to the kitchen to check whether you might not have left some chocolate simmering on the hob. And of course you never have….but while you are there, it’s so easy just to check that you have enough ingredients and it’d be reasonable to make sure nothing has gone stale. But what if they *do* go stale – not immediately, but soon? In an emergency situation, what would you do? Why not just make some now, to be on the safe side? After all, they keep for ages in an airtight container in the fridge. No one has to eat anything, but at least it would save things going to waste. And then the neighbours see you making cupcakes at 3.00 a.m. and accuse you of being a crazy addict. You try to reason with them. You explain it was just prudence and being careful. In the end you have no option but to kill them all. When you try to justify your actions, no one understands you, and you feel the whole world has gone crazy. That’s all I’m sayin’ – it’s a slippery slope. wish id seen this before using all the chocolate making Easter eggs.Now have to wait for the store to open and get more..Thank you. These are so good! They make my heart happy! Thanks for the great recipe! 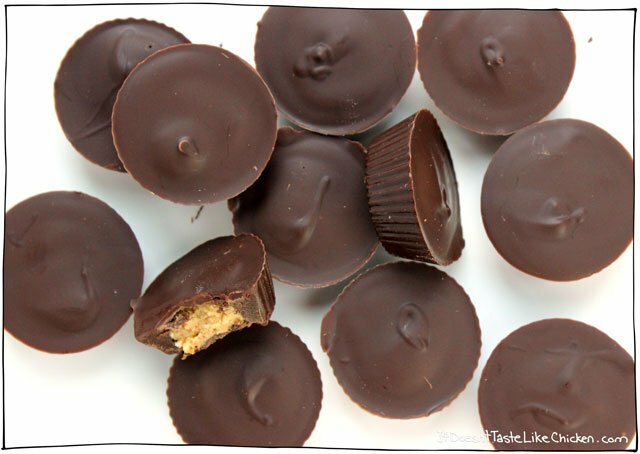 Reese’s was definitely my favorite candy as a kid…you really can’t go wrong with chocolate and peanut butter. Yay for these being solid at room temperature!! Thanks for all the helpful tips! Hey–Looks like a tasty recipe, but I don’t do chocolate. Would carob chips substitute? Absolutely! Just follow these instructions for melting the carob chips. Enjoy! As one of the anonymous Aunts that let you start the big hunt, I’m so glad you have these great childhood memories, and even more glad that you published this recipe. It has been downloaded and waiting to be made. Now this is a really important recipe! I’m making these with Emma. i’m glad these are adaptable to a vegan lifestyle because they are a DELICIOUS confection!